19 March 1945: Modified Avro Lancaster B Mk.I Special heavy bombers of No. 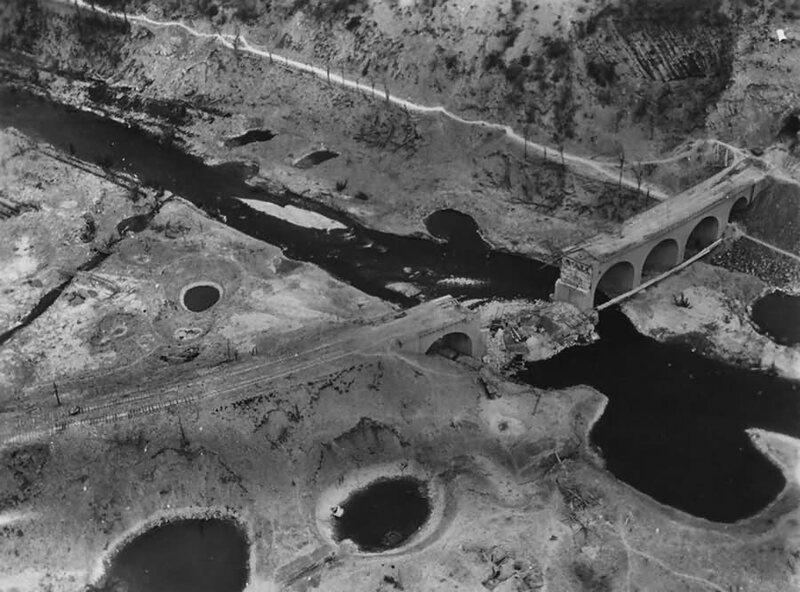 617 Squadron, Royal Air Force, attacked the railway viaduct at Arnsberg, Germany, using the 22,000 pound (9,979 kilogram) Grand Slam earth-penetrating bomb. The bomb had been first used just days before, 14 March, against another railway viaduct. Wallis’ idea was that a very heavy, supersonic bomb could penetrate deep into the earth and detonate, causing an “earthquake” which could destroy nearby heavily protected targets. The Grand Slam bomb (officially, “Bomb, D.P. , 22,000-lb., Mk I”) was 25 feet, 5 inches (7.747 meters) long and had a maximum diameter of 3 feet, 10 inches (1.168 meters). 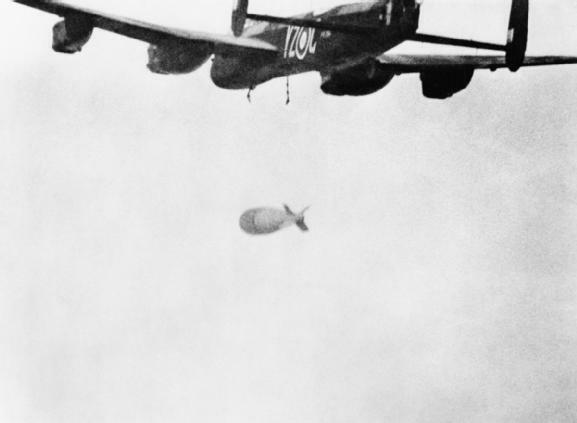 When fully loaded with the explosive material, Torpex, the bomb weighed 22,400 pounds (10,160 kilograms). 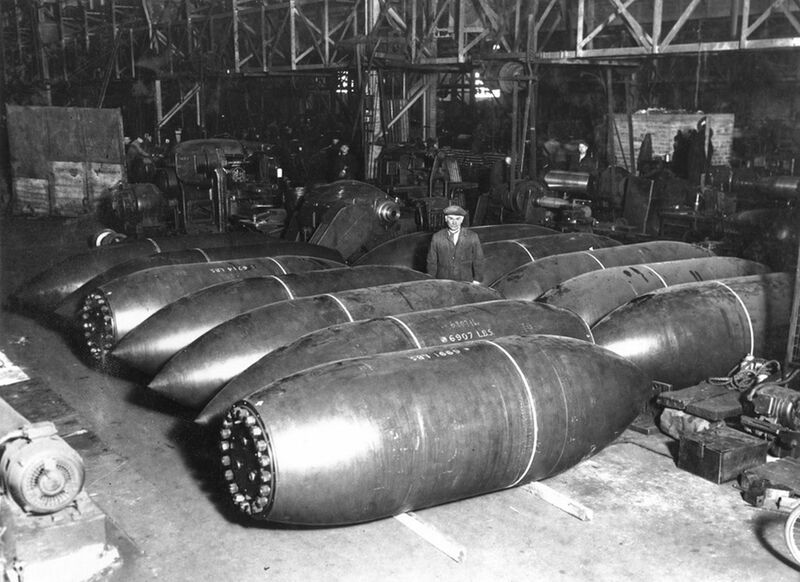 The bomb case was cast of steel at the Clyde Alloy and Steel Company, Glasgow, Scotland, then, after several days of cooling, machined to its precise shape. The casing made up approximately 60% of the bomb’s total weight. At the nose, the casing had a wall thickness of 7.75 inches (19.685 centimeters). 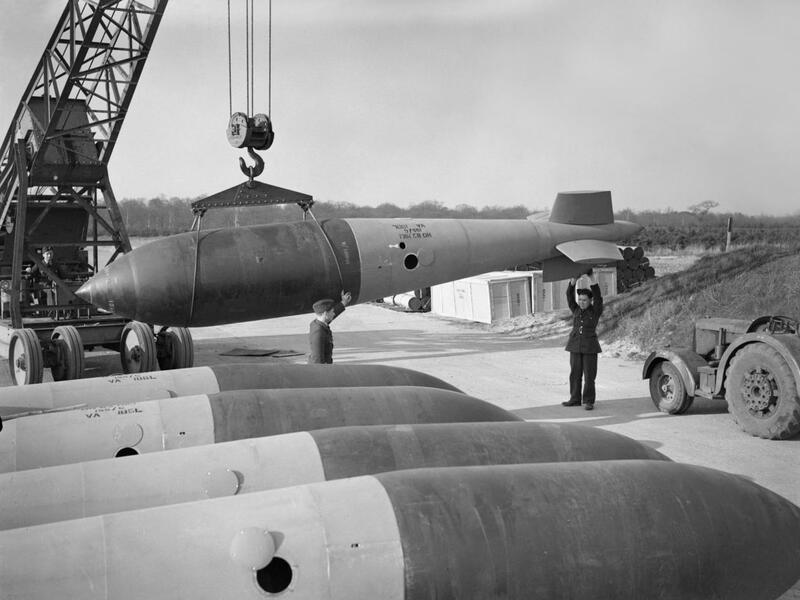 The bomb case was filled with approximately 9,200 pounds (4,173 kilograms) of molten Torpex, with a 1 inch (2.54 centimeters) topping of TNT. 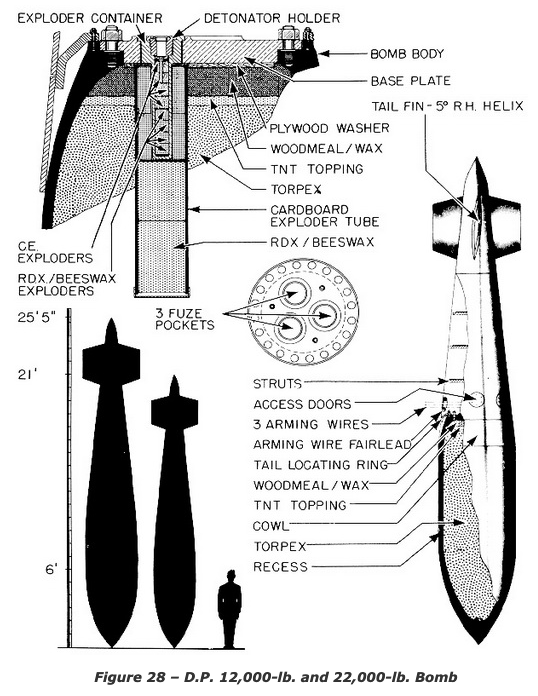 Torpex was an explosive designed for torpedo warheads and depth charges. It was made up of approximately equal quantities of two other explosives, Research Department Formula X (RDX), 42%, and trinitrotoluol (TNT), 40%, mixed with 18% powdered aluminum and wax. The resulting combination was approximately 1.4 times more powerful than TNT alone. About one month was required for the explosive to cool after being poured into the bomb case. Arnsberg railway viaduct following Grand Slam bombing attack. Barnes Neville Wallis, Esq., M. Inst. C.E., F.R.Ae.S., Assistant Chief Designer Vickers-Armstrongs Ltd., was appointed Commander of the Most Excellent Order of the British Empire (Civil Division), by His Majesty, King George VI, 2 June 1943. Sir Barnes Neville Wallis C.B.E., was knighted by Her Majesty, Queen Elizabeth II, 13 December 1968. 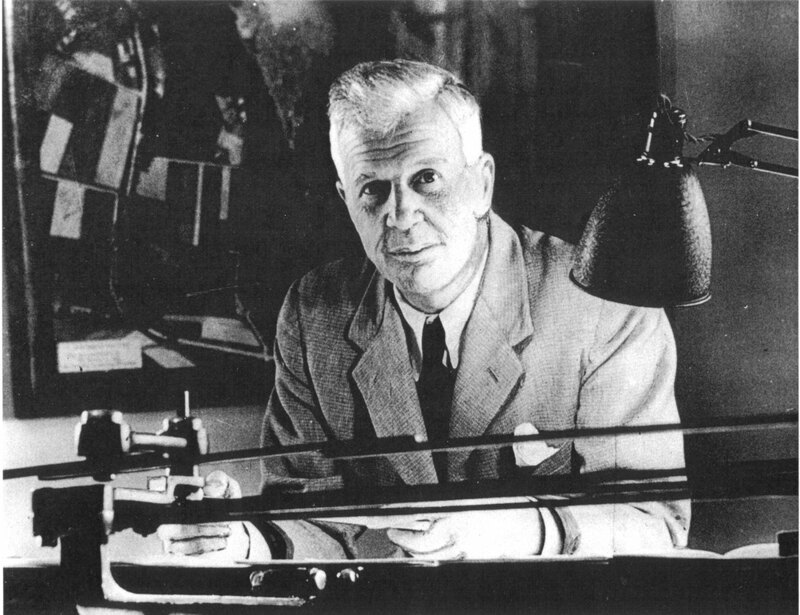 Sir Barnes Neville Wallis C.B.E. 1 August 1943: Operation TIDALWAVE. 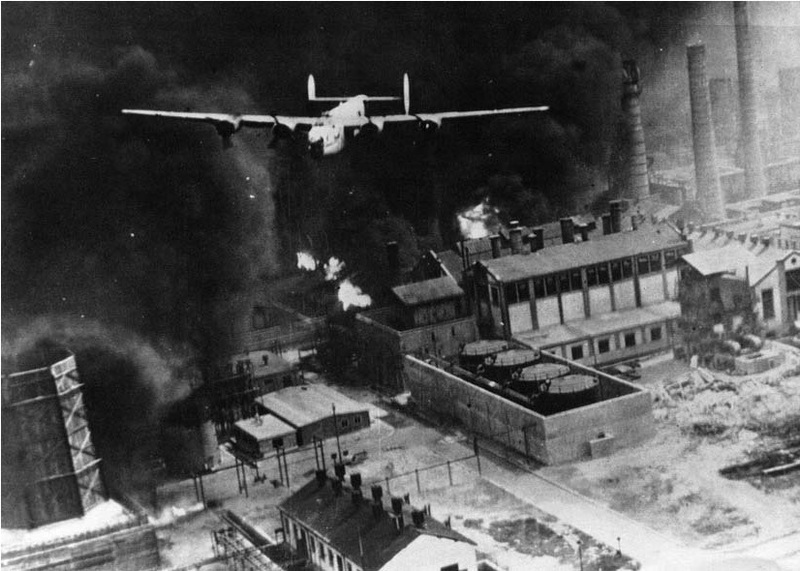 178 B-24 Liberator very long range heavy bombers bombers of the 8th and 9th Air Forces, with 1,751 crewmen, made an extreme low-level attack on the Axis oil refineries at Ploesti, Romania. 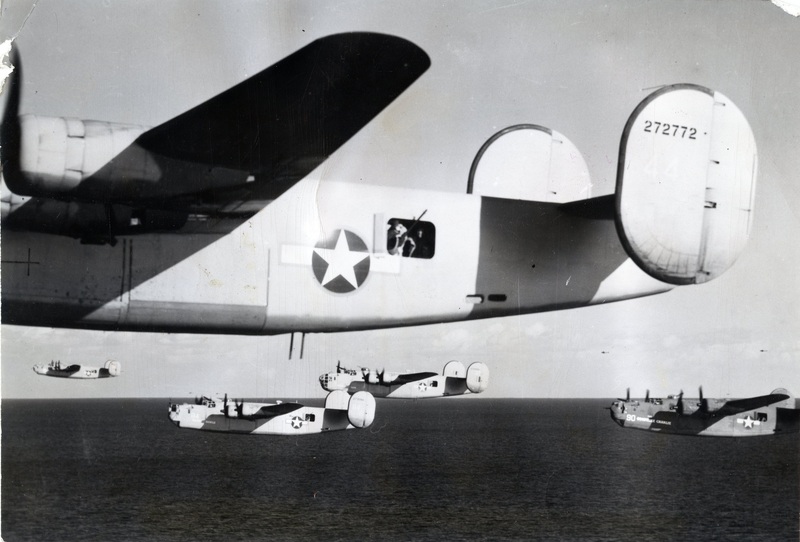 The mission was a disaster: 53 B-24s were lost, 310 crewmen killed in action, 108 captured, and 78 interred in neutral countries. 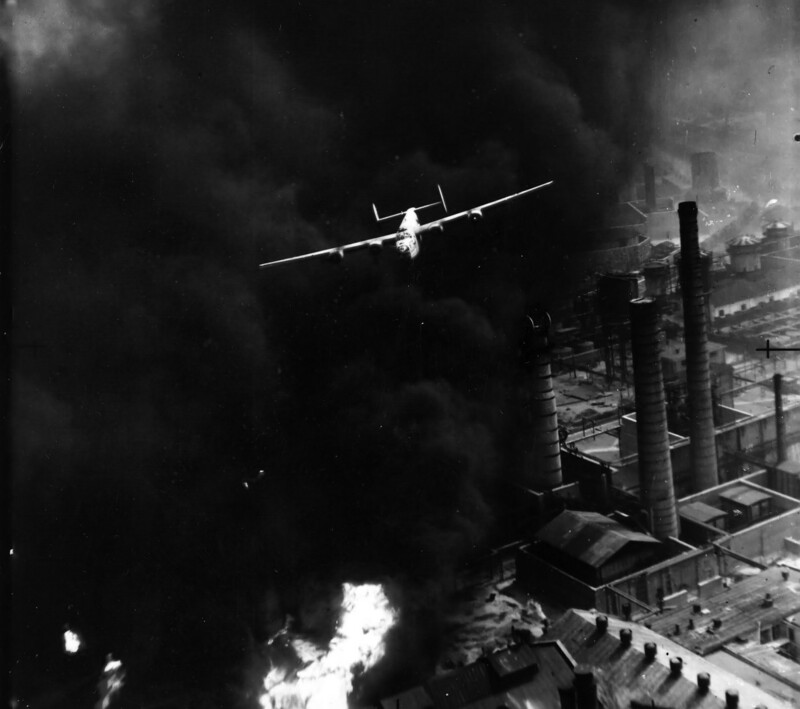 The damaged refineries were repaired within weeks and their output was higher than before the attack. Five Medals of Honor were awarded, three posthumously, the most for any single air action in history. Prior to World War II, the U.S. Army Air Corps (Army Air Forces as of June 20, 1941) developed a doctrine of high-altitude, precision, daylight, massed bombing of selected enemy military and industrial targets. 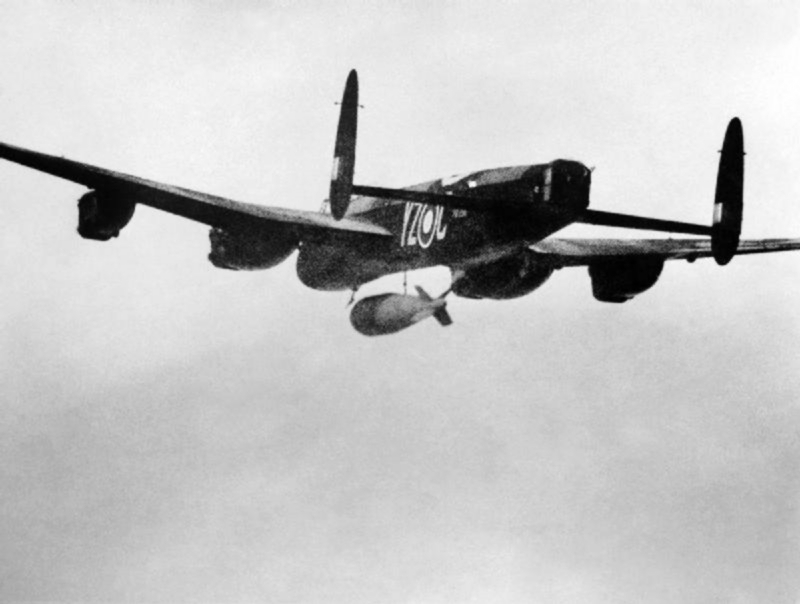 Combined with the Royal Air Force’s concentration on mass air attacks on industrial areas at night by 1943, this doctrine evolved into the Combined Bomber Offense featuring “around-the-clock” bombing of German targets. Petroleum production and distribution systems were among the highest priority targets, and perhaps the most inviting of these was the concentration of oil refineries at Ploesti, Rumania, which according to Allied intelligence estimates, produced as much as one third of Germany’s liquid fuel requirements. One of the most heavily defended targets in Europe, Ploesti lay outside the range of Allied bombers from England but could be reached by Consolidated B-24 Liberator bombers from the Middle East or North Africa. 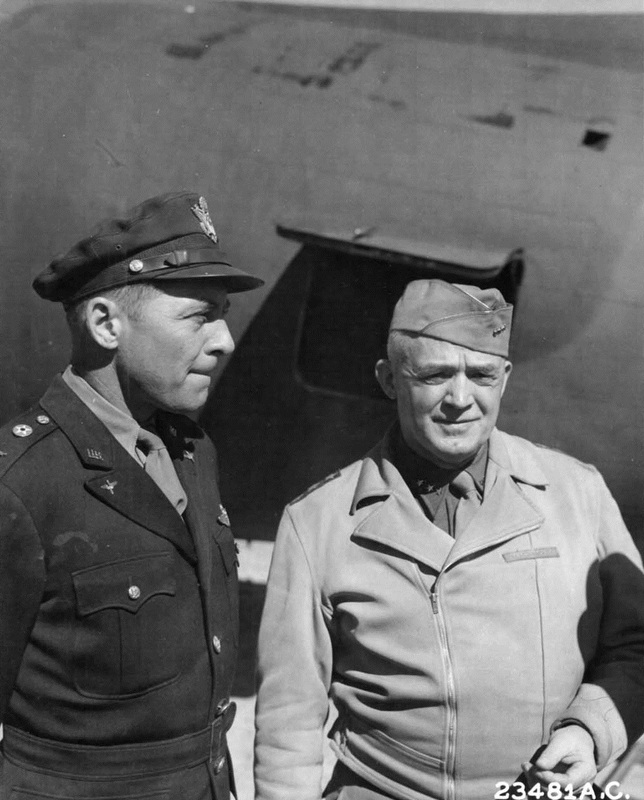 Allied leaders determined to bomb Ploesti during the Casablanca Conference in January 1943 and Gen. Henry H.” Hap’ Arnold delegated the problem to Col. Jacob Smart of his Advisory Council. 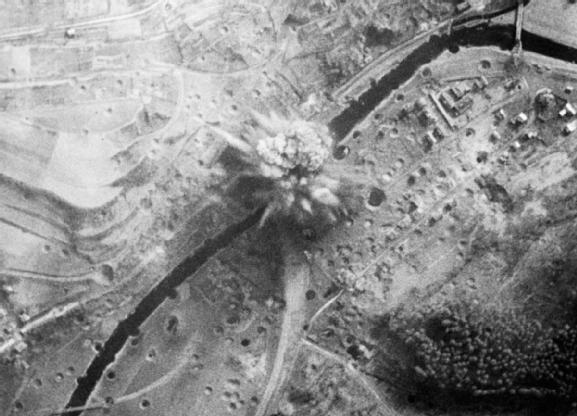 Smart, the principle architect and planner for Operation TIDALWAVE, proposed, in complete antithesis of USAAF bombing policy, a low-level massed raid on the nine most important Ploesti refineries by five B-24 bomb groups, two from North Africa and three borrowed from Eighth Air Force in England . By July 1943, the five groups—the 44th, 93rd, and 389th Bombardment Groups from England had joined the 98th and 376th Bombardment Groups at Benghazi, Libya, where they made final preparations and conducted additional low-level training under the direction of Ninth Air Force. Commanded by Brig. 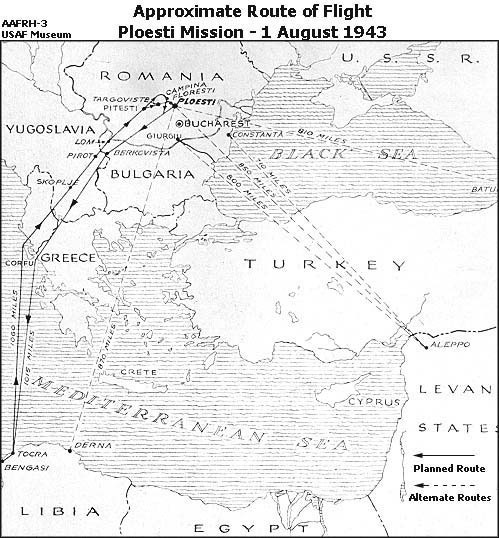 Gen. Uzal G. Ent, the force of 178 B-24s took off on the morning of 1 August, followed a route across the Mediterranean, passed the island of Corfu, crossed the Pindus Mountains into Rumania, and approached Ploesti from the east. While over the Mediterranean the formation divided into two parts: the first led by Col. Keith K. (K.K.) Compton commander of the 376th, consisted of the 376th and 93rd Bomb Groups; the second led by Col. John R. (Killer) Kane, commander of the 98th, included the 98th, 44th, and 389th Bomb Groups. Mandated radio silence prevented the leaders from reassembling the formation. The goal of a single, mass attack disappeared. Compton’s formation reached Rumania well ahead of Kane’s. It descended to low level and, in error, made its planned turn to the south at Targoviste, miles short of the correct Identification Point (IP). Compton led two bomb groups toward Bucharest. 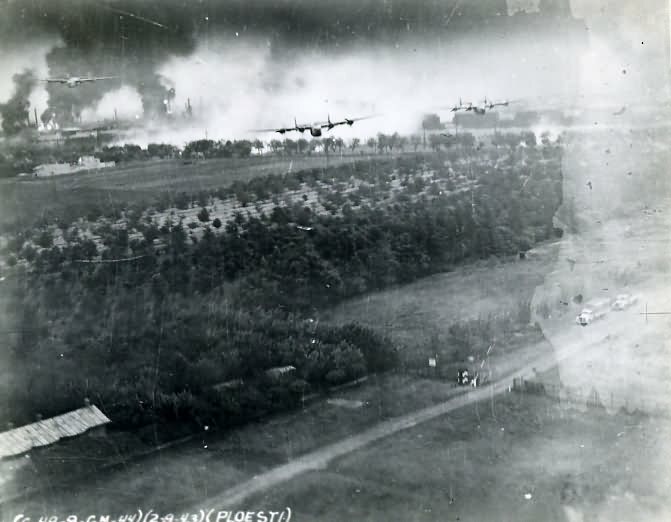 Col. Addison L. Baker, commanding the 93rd Bomb Group following Compton, saw Ploesti to his left, turned his group and led it into the target first. Meantime, Compton found that he was heading to Bucharest and turned, almost reversing course, and bombed Ploesti from the south. As the two groups emerged from Ploesti and escaped to the south, the 98th and 44th Bomb Groups led by Kane plunged into Ploesti where they found many of their targets in flames. They sought alternate targets of opportunity. 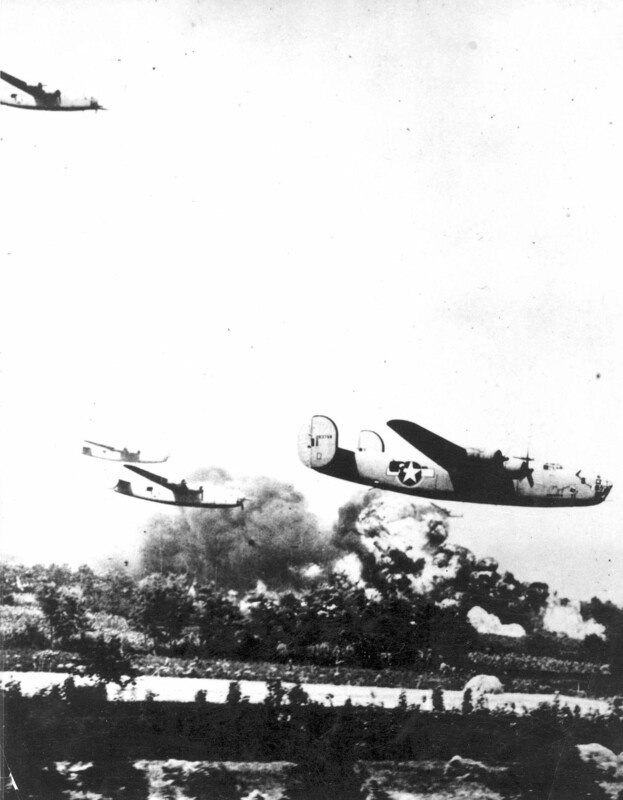 Far to the north, the 389th Bomb Group successfully bombed its target, a separate refinery at Campina, as planned. Survivors of the attack fled south alone or in small groups trailed by Axis fighters which took a toll of the weakened force. Bombers crashed in fields or disappeared into the water; some diverted to Allied bases in the region; others sought sanctuary in neutral Turkey. 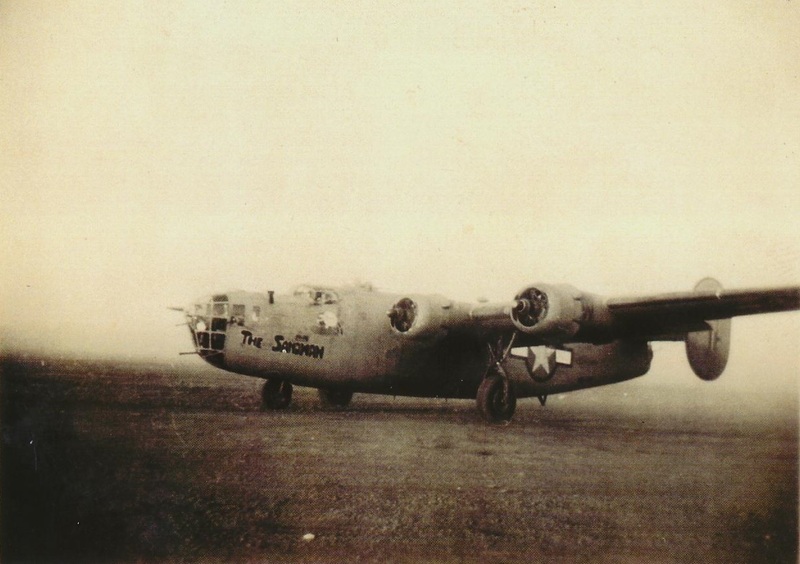 Some 88 B-24s, most badly damaged, managed to return to Benghazi. Personnel losses included 310 airmen killed, 108 captured, and 78 interned in Turkey. Five officers: Kane, Baker, Col. Leon W. Johnson, Maj. John L. Jerstad, and 2nd Lt. Lloyd H. Hughes, earned the Medal of Honor; Baker, Jerstad, and Hughes posthumously. Despite the extreme heroism of the airmen and their determination to press the mission home, the results of Operation TIDAL WAVE were less than expected. TIDALWAVE targeted nine major refineries that produced some 8,595,000 tons of oil annually, about 90 percent of all Rumanian oil production, and the attack temporarily eliminated about 3,925,000 tons, roughly 46 percent of total annual production at Ploesti. Three refineries lost 100 percent of production. Unfortunately, these losses figures were temporary and reflected much less than the planners had hoped for. The Germans proved capable of repairing damage and restoring production quickly, and they had been operating the refineries at less than full capacity, anyway. Ploesti thus had the ability to recover rapidly. The largest and most important target, Astro Romana, was back to full production within a few months while Concordia Vega was operating at 100 percent by mid-September. The U.S. Army Air Forces never again attempted a low level mission against German air defenses. Dr. Roger Miller, Historian, AFHSO. Air Force Historical Studies Office Joint Base Anacostia Bolling, DC. 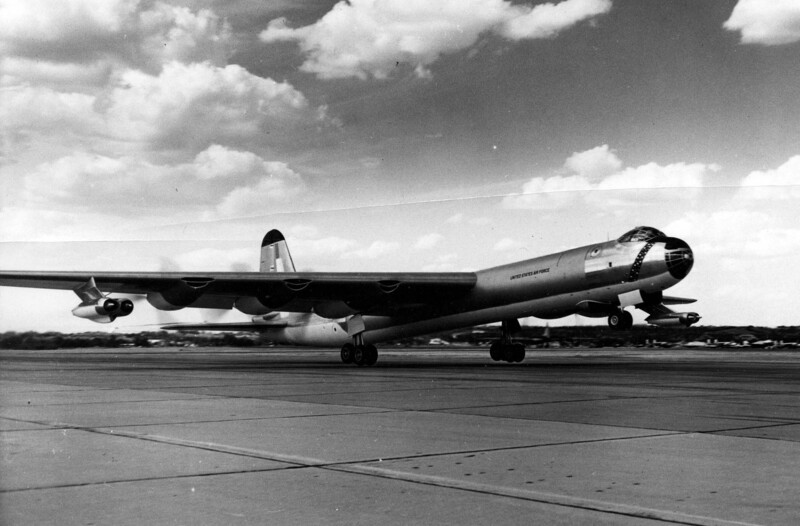 1 July 1954: The final Convair B-36 Peacemaker, B-36J-10-CF 53-2727, a Featherweight III variant, completed assembly at Convair Division of General Dynamics plant at Fort Worth, Texas. 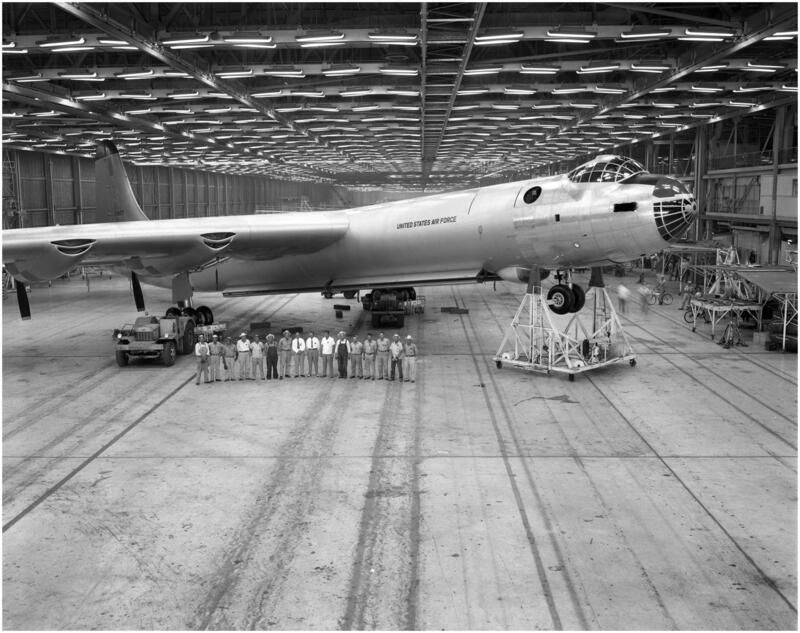 The last B-36 built, this was also the very last of the ten-engine very long range heavy bombers in service. It was retired 12 February 1959, and is now in the collection of the Pima Air and Space Museum, Tucson, Arizona. Convair B-36J 52-2827 is one of 14 Featherweight III high altitude variants. It was built without the six retractable defensive gun turrets of the standard B-36, retaining only the two 20 mm autocannons in the tail. This reduced the crew requirement to 13. The bomber is 162.1 feet (49.4 meters) long with a wingspan of 230.0 feet (70.1 meters) and overall height of 46.8 feet (14.3 meters). The wings had 2° dihedral, an angle of incidence of 3° and -2° twist. The wings’ leading edges were swept aft to 15° 5′. The airplane’s total wing area was 4,772 square feet (443.33 square meters). The B-36J III has an empty weight of 166,165 pounds (75,371 kilograms) and its maximum takeoff weight is 410,000 pounds (185,973 kilograms). The B-36J has ten engines. 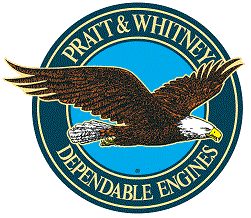 There are six air-cooled, turbosupercharged 4,362.494 cubic-inch-displacement (71.488 liter) Pratt & Whitney Wasp Major C6 (R-4360-53) four-row, 28-cylinder radial engines placed inside the wings in a pusher configuration. These had a compression ratio of 6.7:1 and required 115/145 aviation gasoline. 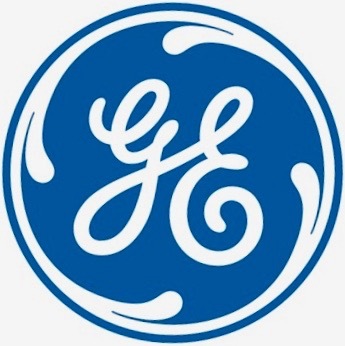 The engines incorporated an internal single-stage supercharger, but were also each equipped with two General Electric BH-1 turbosuperchargers. The R-4360-53 had a Normal (continuous power) rating of 2,800 horsepower at 2,600 r.p.m., and Military Power rating of 3,500 horsepower at 2,800 r.p.m., with a 30 minute limit. Its maximum rating was 3,800 horsepower at 2,800 r.p.m. with water/alcohol injection for takeoff, with a 5 minute limit. The engines turned three-bladed Curtiss Electric constant-speed, reversible pitch propellers with a diameter of 19 feet, 0 inches (5.791 meters) through a 0.375:1 gear reduction. The R-4360-53 is 9 feet, 9.00 inches (2.972 meters) long, 4 feet, 7.00 inches (1.397 meters) in diameter, and weighs 4,040 pounds (1,832.5 kilograms). Four General Electric J47-GE-19 turbojet engines are suspended under the wings outboard of the radial engines in two-engine pods. The J47 is a single-shaft axial-flow turbojet engine with a 12-stage compressor section, 8 combustion chambers, and single-stage turbine. The J47-GE-19 was modified to run on gasoline. It had a continuous power rating of 4,730 pounds of thrust (21.040 kilonewtons) at 7,630 r.p.m., and Military Power rating 5,200 pounds of thrust (23.131 kilonewtons) at 7,950 r.p.m., 30 minute limit (5 minutes for takeoff). The J47-GE 19 was 3 feet, 3 inches (0.991 meters) in diameter, 12 feet, 4 inches (3.658 meters) long, and weighed 2,495 pounds (1,132 kilograms). The B-36J Featherweight III had a cruise speed of 202 knots (232 miles per hour/374 kilometers per hour) and a maximum speed of 375 knots (432 miles per hour (695 kilometers per hour) at 38,000 feet (11,582 meters). The service ceiling was 43,700 feet (13,320 meters). It had a combat radius of 3,465 nautical miles (3,987 statute miles/6,417 kilometers) with a 10,000 pound (4,536 kilogram) bomb load. The maximum ferry range was 8,200 nautical miles (9,436 statute miles/15,186 kilometers). The B-36J III had a maximum bomb load of 72,000 pounds (32,659 kilograms), carried in four bomb bays. The bomb bay capacity was limited by the physical size of each type weapon, rather than its weight. This ranged from as many as 132 500-pound bombs, 28 2,000-pound bombs, or 4 12,000-pound bombs. It could carry a single 43,600 pound (19,777 kilogram) T-12 Cloudmaker, a conventional explosive earth-penetrating bomb, or several nuclear fission or thermonuclear fusion bombs. By combining the bomb bays, one 41,400 pound (18,779 kilogram) Mk.17 15-megaton thermonuclear bomb could be carried. 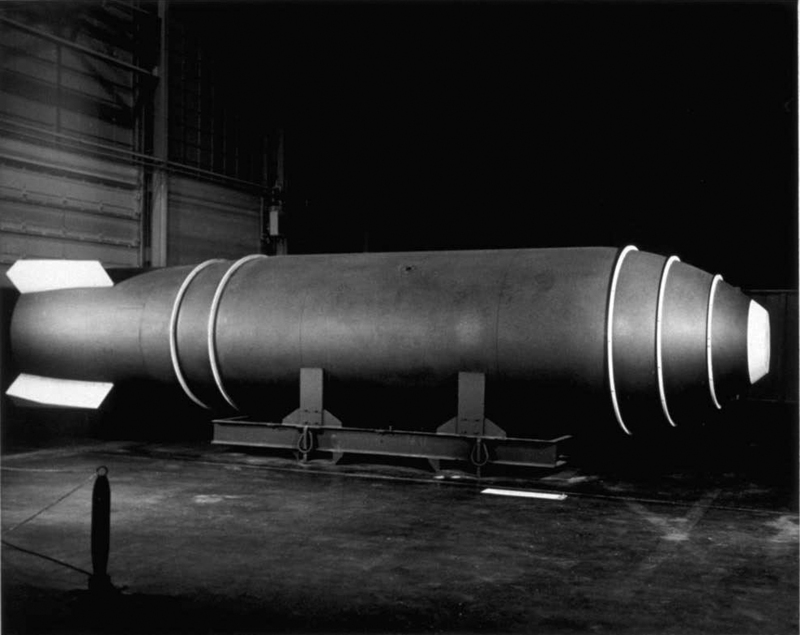 Los Alamos Scientific Laboaratory-designed Mk.17 two-stage radiation implosion thermonuclear bomb. For defense, the B-36J Featherweight III two M24A1 20 mm autocannons in a remotely operated tail turret, with 600 rounds of ammunition per gun. Between 1946 and 1954, 384 B-36 Peacemakers were built. They were never used in combat. Only five still exist.